It has been wickedly cold this week. The lovely “polar vortex” which inhabited much of the Midwest and other states has finally moved out of here. I finally took the dog on a walk, where she walked normally instead of hopping about earlier this week, lifting her paws up in pain from the subzero temps a few days ago. Today it was 18 degrees F, a virtual heat wave compared to the -26 degrees F I was driving in yesterday morning. Anyway, three days ago found me indoors looking out my back window at my bare crab apple tree, with beautiful violet shadows on the bright glistening snow. I noticed that some crazy robins had made a bad judgement call and had come back in the ghastly month of January instead of March like they usually do. They were sitting in subzero temps, trying to keep warm, their feathers puffed out like little down jackets. You could probably read their minds— “What the heck are we doing here? 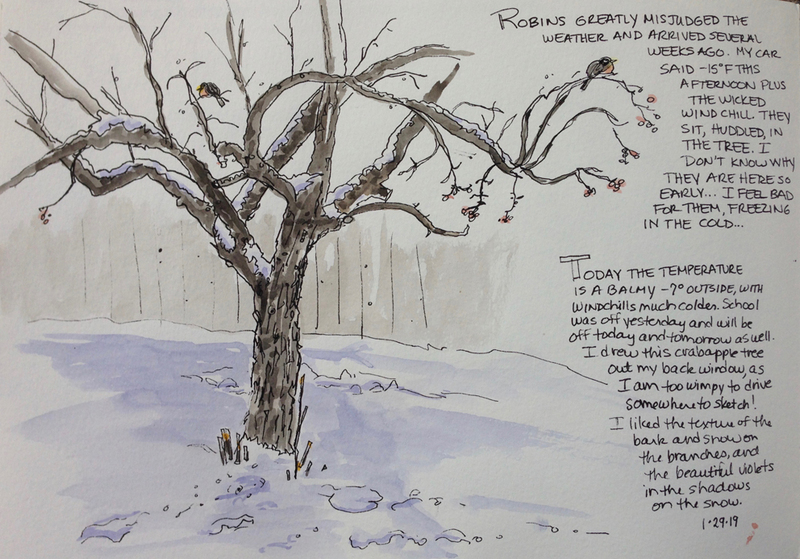 ?” Anyway, I started sketching and couldn’t stop, the tree with its gnarly branches and dried-up berries enticing me to notice each little layer and detail. I added the robins in, knowing they added the perfect touch! Then I worked the rest of the boot, adding details as I went. You can see the second boot is folded over, and I had a little trouble getting this effect on my sketch. But after the pen and watercolor were put down, with several layers to get darker values, and my handy white gel pen was used to put in the stitching, I am pleased with the sketch. The shadows are a little more violet than I wanted, but that’s OK. Goes to show you that even stuck indoors, a polar vortex can’t stop me from sketching!